Well, we’ve concluded our full array of battery tests and the results await your inspection after the break. 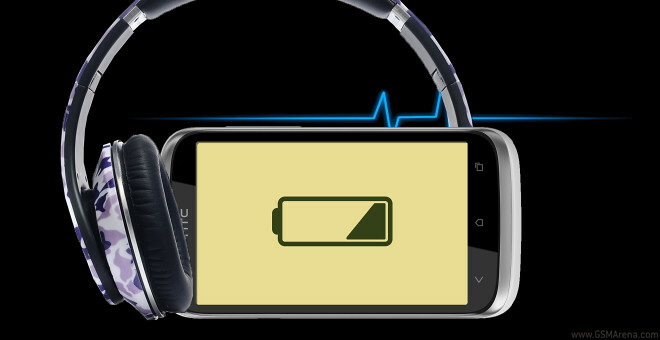 We start off with talk time – where the HTC Desire X passed the test with flying colors. It managed little over 11 hours, so it’s safe to say you could count on the little fella to be a proper phone. Next up is web browsing. The Desire X wasn’t very impressive here – it only did 5 hours and 16 minutes, which isn’t the worst score around but it’s far from the best. We’d give the Desire X a Good for the effort. Finally, it’s our video endurance test – how well can the phone do in case you need to be entertained during a long flight or transit ride. Well the Desire X managed 5 hours and 38 minutes before it stopped video playback and demanded to be hooked to a power supply. Another middling result, which isn’t all that bad. 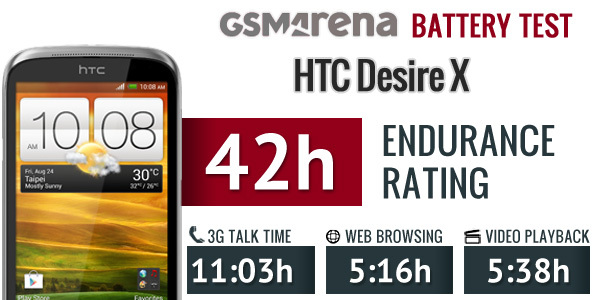 So to summarize the HTC Desire X get an endurance rating of 42 hours. If we break it down that would mean you could do an hour of talking, an hour of browsing the web and an hour of watching a video and the phone would need to be charged in 42 hours. This ranks the Desire X as a good all round battery performer. And we give credit where it’s due, HTC managed to squeeze out a good amount of battery out of such a pocket-friendly device, though we wish for a bit more endurance from the browser and the video player.